PLACE chicken fillets in a greased baking dish and coat ZoOSh Satay Sauce. Bake at180°C for 30 minutes or until cooked through. WHISK together the eggs, milk, flour, butter and salt until smooth. Stir in spring onions and stand for 15 minutes. HEAT extra butter in a crepe pan and cook 800ml ladles of batter to make 20 pancakes. Cook until browned, then remove and keep warm. SLICE chicken then return it to the baking dish along with cooking juices, toss to coat. Arrange a few snow peas along the centre of each pancake. Top with some chicken, then roll up to enclose. 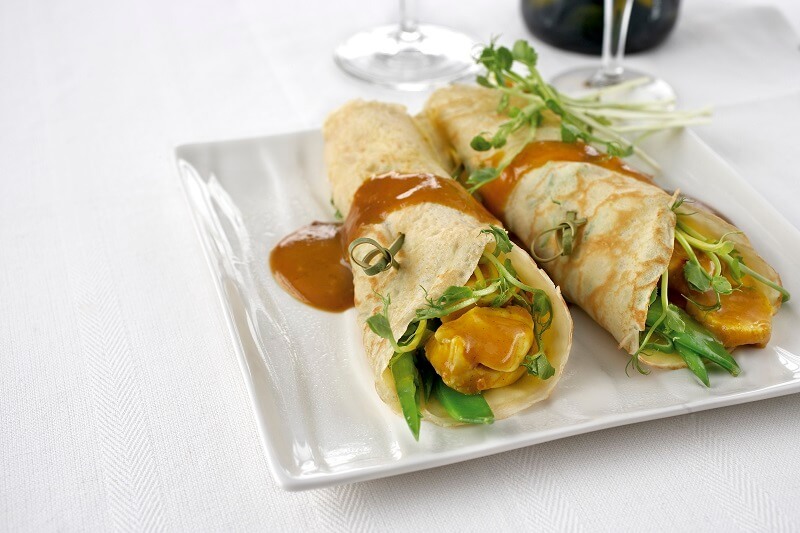 Serve pancakes with extra ZoOSh Satay Sauce and topped with snow pea shoots.